A re-established Dartmouth chapter of the American Association of University Professors was unveiled at a general faculty meeting. According to co-president of the Dartmouth chapter of the AAUP and history professor Annelise Orleck, the current chapter is focused on advocating for faculty and introducing proposals on issues such as the tenure process and academic freedom. The AAUP is a national organization of professors focused on academic freedom that includes more than 500 colleges and universities. 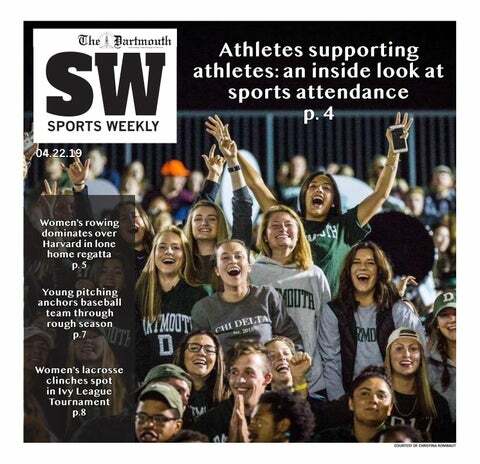 Currently, the Dartmouth chapter has at least 50 dues-paying members and is led by an executive board of seven faculty members and adjunct professors from various departments. According to Orleck, the AAUP had a chapter at the College as early as 1916, and the College’s chapter was influential in the creation of the tenure process and in providing the faculty a greater voice on College personnel and curriculum issues. A group of faculty began re-establishing the College’s AAUP chapter in the fall of 2017 in order to support academic freedom and the tenure process. This came after the College President Phil Hanlon released a letter condemning history lecturer Mark Bray following his public comments about self-defense and the far-left “Antifa” movement, Orleck said. Orleck also noted that the condemnation of Bray led to over 100 faculty members signing a letter disapproving the College’s actions and over 200 faculty members joining the Coalition for Academic Freedom at Dartmouth. “The censoring of Mark Bray was a dangerous infringement on the speech rights of faculty,” she said. Though Bray’s condemnation was a catalyst for the AAUP’s increased presence, the chapter is concerned about a variety of issues, such as the tenure process, treatment of adjunct professors, Dartmouth retention of faculty of color and sexual misconduct. The chapter has three major goals regarding specific policy changes. First, the chapter’s working group on the tenure and promotion processes has released a first draft of its recommendations to improve these areas. The proposal recommends increasing transparency, communication and mentoring opportunities throughout the tenure process. The chapter hopes that these changes, if adopted, could help Dartmouth have the fairest tenure process in the Ivy League, Orleck said. The proposal also recommends more consistency and implementing bias training throughout the tenure process. Orleck noted that a specific concern about the tenure process arose after several tenure denials that she claimed many faculty believed were unjust, including instances when department recommendations for tenure were ignored. The chapter’s working group on academic freedom has drafted a recommendation to change the statement about academic freedom in the Organization of the Faculty of Dartmouth College, which is one of the main guideline documents for faculty at the College. The proposed revision would ensure that faculty members can practice academic freedom without concern of condemnation. The chapter also has a working group on contingent labor to address concerns about adjunct faculty members. Orleck noted that adjunct faculty often serve in advisory roles, which they are not explicitly paid to do. She claimed that it is unfair to both students and professors that the current system does not compensate faculty for their work in an advisory capacity. Orleck cited specific concern about a lack of transparency in payment and titles. While the AAUP’s sister organization, called the AAUP Collective Bargaining Congress, engages in collective bargaining as a labor union would, the chapter on Dartmouth’s campus does not intend to serve in that capacity at the moment. Orleck said that the chapter instead hopes to help the faculty through working group recommendations and other support systems. The chapter is also interested in working on measures to promote the support and retention of faculty of color and to strengthen policies surrounding sexual misconduct. “We believe it is important to clarify and support the responsibilities and accountability of department chairs and deans, across the institution, not just in [Psychology and Brain Sciences], to listen to and take seriously anyone who brings concerns or complaints about sexual misconduct or other exploitative behavior, and follow prompt and transparent procedures that do not place undue burden on complainants,” chapter secretary and women and gender studies senior lecturer Giavanna Munafo wrote in an email. She noted that the chapter is currently working on an official statement that will include recommendations about handling sexual misconduct allegations. “Responsibility lies with everyone who is aware that people are being harassed or in other ways abused and does nothing to stop it,” she wrote. The chapter will also serve in a general capacity to assist and stand up for faculty, according to chapter treasurer and economics professor Erzo Luttmer. He noted that the formal structure of the College’s administration does not promote the successful incubation of ideas, a role in which the AAUP can thrive. Luttmer added that the AAUP’s ability to be nimbler and more efficient than the College’s administration allows it to intervene and assist the College effectively. “The AAUP will be a mechanism for faculty to interact with each other and think … about how to make life better here at Dartmouth,” Luttmer said. Correction appended (June 30, 2018): This article has been updated to correct the spelling of Munafo's first name.